Aarsleff, one of the UK’s leading contractors of driven precast concrete piles, has been awarded the contract for piling works on two sections – Ditton Junction Bridge and Widnes Victoria Loops Viaduct – of the major infrastructure Mersey Gateway project. When complete the Mersey Gateway Project will bring much needed traffic relief for the existing Silver Jubilee Bridge, resulting in infrastructure investments necessary to deliver regeneration of Halton and the North West. 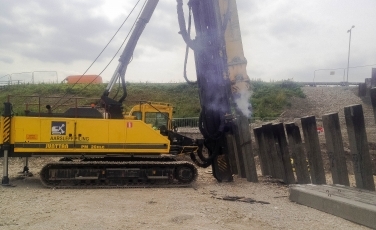 Piling works on the Ditton Junction Bridge and Widnes Victoria Loop Viaduct sections commenced 1 June 2015, although Aarsleff has been involved in the Mersey Gateway project for over 9 months, undertaking an intense programme of test piling (completed Dec 14 / Jan 15) and assisting in a very specific technical design solution – a solution unique within the UK driven market which Aarsleff could provide due to the European group capabilities. The use of ‘raked’ precast piles for the bridge abutment structures is also significant and delivers numerous benefits to the project. This type of piled solution is not common within the UK civils market; this is an approach Aarsleff want to challenge on future projects. To satisfy the design specification Aarsleff is using a Centrum cage former, which is used widely on the continent, but for the first time in the UK, to meet with the unique specification demands set by the designer. With Aarsleff operating in Europe, it has a common operating system within its Centrum pre-cast pile factories, which allows this unique approach to a solution to be adopted across the business. The type of cages being fabricated for use within the 350mm square sections are completely unique and require the Company’s ‘A Class’ mechanical locking joint to ensure a robust quality product is supplied for installation. Additionally, each pile cage has a complex internal cage structure including tightly pitched helical and additional 40mm Rebar to withstand the forces being applied to the piles from the overlying structure. All of the pile fabrication solutions were trialled within the Centrum manufacturing plant to ensure compliance with the spec and a safe and quality product was manufactured. Both Aarsleff and Centrum ensured a transparent approach was adopted from the outset and invited the client to witness the Centrum factory and supported full production surveillance. Specifically the works will include installing 174-no. 20m long, 350 piles at Ditton, foundations for a bridge and 244-no. 21m long, 350 piles at Victoria, which will form the foundations for the approach viaduct to the new Mersey Bridge. Piling will be carried out using the Company’s own Junttan PM20s complete with a high performance 7-tonne and a 5-tonne hammer. Delivery of the program will require accurate and robust planning as logistics are intricate and challenging. The project construction works are being delivered by a construction joint venture between FCC Construction S.A., Samsung C&T ECUK Limited and Kier Infrastructure and Overseas Limited, and is a continuation of works, in which Aarsleff has been involved, with future works expected to follow.